The prose writings of Charles Olson (1910–1970) have had a far-reaching and continuing impact on post-World War II American poetics. Olson's theories, which made explicit the principles of his own poetics and those of the Black Mountain poets, were instrumental in defining the sense of the postmodern in poetry and form the basis of most postwar free verse. The Collected Prose brings together in one volume the works published for the most part between 1946 and 1969, many of which are now out of print. A valuable companion to editions of Olson's poetry, the book backgrounds the poetics, preoccupations, and fascinations that underpin his great poems. Included are Call Me Ishmael, a classic of American literary criticism; the influential essays "Projective Verse" and "Human Universe"; and essays, book reviews, and Olson's notes on his studies. In these pieces one can trace the development of his new science of man, called "muthologos," a radical mix of myth and phenomenology that Olson offered in opposition to the mechanistic discourse and rationalizing policy he associated with America's recent wars in Europe and Asia. 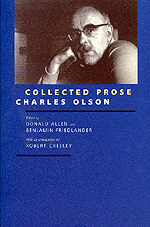 Editors Donald Allen and Benjamin Friedlander offer helpful annotations throughout, and poet Robert Creeley, who enjoyed a long and mutually influential relationship with Olson, provides the book's introduction. Donald Allen was a longtime friend, editor, and publisher of Charles Olson. He has also edited The New American Poetry, 1945–1960, The Collected Poems of Frank O'Hara, and the writings of Lew Welch. He is currently CEO of Grey Fox Press in San Francisco. Benjamin Friedlander is the author of several books of poetry and editor of Area Lights Heights: Writings 1954–1989 by Larry Eigner. He is currently a doctoral candidate at the State University of New York, Buffalo. Robert Creeley is Samuel P. Capen Professor of Poetry and the Humanities at the State University of New York, Buffalo.